The Mulford House represents one of the most important and complex artifacts produced by our culture – the family home. The house, built in 1680, is a remarkable survival that has been left largely unchanged since 1750. The majority of the framing and wood members of the house have been left undisturbed, enabling scholars to tell the story of the successive changes over time. In addition to the house’s architectural significance, the home has remained in Mulford hands for the majority of its existence, giving scholars the opportunity to trace the family, their use of the land, and creation of the built environment around them. The lives and spirit of this family echo throughout the house, where all but one room on the ground floor has been restored using period appropriate furnishings and authentic decorative arts. Initially the visitor enters the original “Hall.” Here one will become a detective, and shown a variety of clues and evidence which aided our specialists in discovering the history of the Mulford Farm. At the time the house was built, East Hampton was a well-established village. Most of the older colonists had brought with them their traditional ways of life, including religious beliefs, laws, methods for cultivating land, social customs, architecture and building techniques. The people who lived on the Mulford Farm, not unlike ourselves, made periodic alterations to their structures to meet changing family needs. The changes they wrought were determined by prevailing architectural styles, the skill of local craftsmen, technology, family wealth, social aspirations, and probably chance. Architectural changes to the house, particularly the construction of lean-to additions, were typical solutions to spatial problems faced by colonists throughout New England. Some of the changes demonstrate the relationship between human needs and fashion. The lean-to addition was not only a response to the need for a separate kitchen area; the lean-to had become fashionable by the early Eighteenth century. By that time, houses like the Home Sweet Home Museum, just south of the Mulford Farm, were being built from the ground up in the “lean-to” style. Home Sweet Home was built in the early to mid-eighteenth century. Twice owned by a member of the Mulford family, the house museum is now owned and operated by the Village of East Hampton. The Mulford Barn, constructed in 1721, is one of the most intact early eighteenth century English-plan barn forms in New York State, and is recognized as an outstanding example of early eighteenth century construction methods and materials. The Mulford Barn was evaluated by the State Department of Parks Recreation and Historic Preservation in 1990 and deemed the second most important eighteenth century barn in New York State. The Mulford Farm is of interest not merely because of its antiquity and its importance to the beauty of East Hampton. Viewed as an artifact which has been shaped to fit the needs and the pleasure of those who have lived in it, the house itself has much to tell us about the origins of Colonial New England society and the changes which still affect our lives in the present-day. The importance of the Mulford Farm has been recognized by state and federal funding agencies as well as foundations who have partially funded stabilization and restoration efforts to date. Partial funding has been provided by the New York State Council on the Arts, New York State Institute for the Humanities, National Endowment for the Arts, National Endowment for the Humanities, Institute of Museum Services, Rock Foundation, J.M. Kaplan Fund, Arthur Ross Foundation, American Express Foundation, Vincent Mulford Foundation, Ben Krupinski Builders, and Ella B. Aldrich. In 1998 a matching grant for $88,000 was awarded by the New York State Department of Parks, Recreation and Historic Preservation for the exterior restoration of the House. The Mulford Barn, built in 1721, according to the inscription on a supporting beam inside the Barn, is part of the Mulford Farm museum site, a three acre parcel that is the last remaining intact original “home lot” – so designated during the mid-seventeenth century settlement of the Village. As an example of traditional English Barn design and construction, the Mulford Barn is significant to the history of English settlement patterns in New York State. The Barn stands in the region of the state where the earliest English settlements were established, an influence that has continued to shape the present day character of the landscape. The Mulford Barn, was evaluated by the State Department of Parks Recreation and Historic preservation in 1990. It was deemed the second most important eighteenth century Barn in New York State given that it retains its original wood frame and other structural elements. 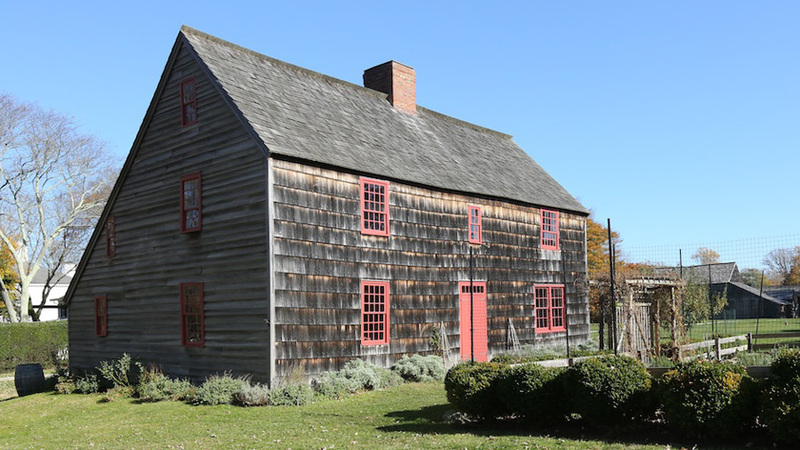 It is recognized as one of the most intact early eighteenth-century English-plan Barn forms in New York State, and is an outstanding example of early eighteenth century construction methods and materials. The Barn represents a virtually intact post and beam frame, with mortise and tenon joints, constructed primarily of first growth oak. It is a large, one and one-half story, rectilinear, wood shingle gable roof, eight post center aisle English plan, with a four post integral lean-to extension on the east side. The 18th century mortise and tenon framing system of the main block is constructed of characteristic first period timber and measures 33′-8″ x 30′-5″. The supporting posts measure approximately eight inches square at their bases, but are “shouldered” at the top where they carry the horizontal girths and plates which in turn support the roof frame. The arrangement on plan of eight posts, four per wall, with four additional posts along the back (east) lean-to wall, is traditional and representative of this generic form. Of particular interest is the lack of mortise holes for studs on the back principal wall (the east wall). The roof frame is composed of hewn rafters which date from the original construction period. Each rafter pair is joined and pegged at the ridge and is “birdsmouthed” to the front and back rafter plates in traditional form. It should be noted that the lean-to rafters are spliced to the top surfaces of each of the eight principal pairs of rafters, and that this is typical of ear]y eighteenth century construction practice. The Mulford South Side Barn Lean-to was a very early, historically significant mid-eighteenth century addition to the main Barn structure. The survival of oak clapboards against the outside south wall frame now covered by the South Side Lean-to roof reveals that this wall was enclosed at a very early date, before the exterior cladding (of original application) of the entire building was updated with shingle. Further investigation of this portion of the Barn will continue. The Barn has been stabilized with restoration including replacing the deteriorated sills, restoring foundation supports, adding hidden structural ties and epoxy-infill to posts and beams, treating the infested Barn with appropriate insect fumigation procedures, and the restoration of interior and exterior wall, roof, and floor sheathing. When the restoration of the Barn is completed, the Barn will permanently extend the exhibit and programming opportunities at Mulford Farm.